When you need a variety of circular shapes in different sizes, the circular JumbleMat is the way to go. Just like the JumbleBoxes(items JUMBL6 andJUMBL10),these casting mats have moveable inserts. 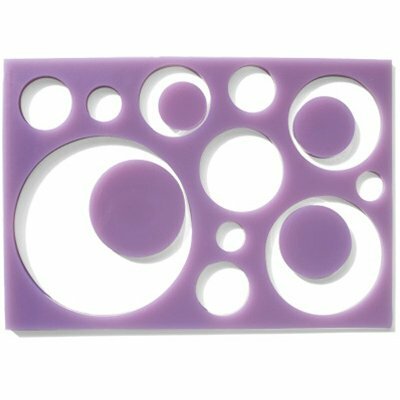 Do you want to create clean, round shapes that are usually tedious to makeNow you can choose how you want to make your crescents, offset rings or other round shapes.With this one mold, you can make hundreds of amenity or showpiece building blocks.Maybe you want a round disc with a square centerIts easy with these mats, just mix and match the inserts from one of the other JumbleMats.Great with sugar, chocolate, gelatin or even polenta.Exterior of mat is approximately 11 tall x 16 wide x thick (approximately 28 cm tall x 41 cm wide x 1 cm thick half sheet pan).Largest circle is 7 diameter.Made of food-contact-safe silicone. Wash before use. Do not heat above 450 F / 232 C.